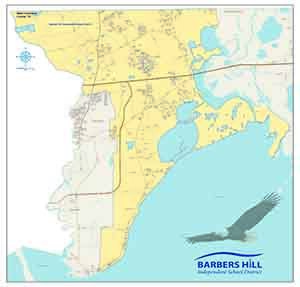 Barbers Hill is located at the intersection of Interstate Hwy 10 and Eagle Drive (FM 3180) in Mont Belvieu, Chambers County, Texas. We are approximately 30 miles east of Houston, and 50 miles west of Beaumont. Take IH 10 East to Exit 800 (FM 3180). Go under the overpass and turn right; ramp veers to the right; go over the interstate. High School is just past the Baptist church as you continue north. Elementary School North is on Perry Ave behind the Agricultural Barn. Eagle Stadium is behind Middle School North. Visitors should turn right on Perry Ave and park on the east side (without press box). The Kelley Practice Building is behind the High School. The Field House is on the south end of the stadium. Visitors should enter between the Administration Building and the Kindergarten Center. The High School gymnasiums are on the south end of the building (nearest the Baptist church). The softball and baseball fields are behind the High School. Visitors should use the last (northern most) entrance. The tennis courts are also behind the High School, but visitors should turn right on Perry Ave and then left into the High School driveway. The Technology office and Maintenance are behind Middle School North at the north end of the press box side of the stadium. The Warehouse is on the north end of visitor side of the stadium. Turn right on Perry Ave.
Transportation is on the east side behind the stadium. Turn right on Perry Ave. The Agricultural Barn is behind Transportation. Take IH 10 West to Exit 800. Turn right and the schools are on your right in the above order. Take SH 146 to Mont Belvieu. Just inside the city limits, turn left on FM 3360. Go about four miles and the schools will be on your left. All facilities will be in reverse order from above.